Feeling inspired by writing up the last post I decided it cant be that hard to convert my USB receiver into an Ethernet based one. 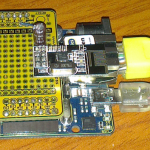 My USB implementation was using an old Freetronics Twenty Ten (the Eleven seems to be the latest equivalent) with one of the nRF modules soldered onto a ProtoShield Short. I didn’t want add more shields as things start to look ugly so I happened to have an EtherTen in my Arduino parts box so in theory its just swap the shield to the new base board, change the code to add the ethernet connection and all done! That’s the theory anyway. Like all good theories it wasn’t that simple. The pins I happened to choose for the nRF module conflicted with the pins used for the Wiznet chip for Ethernet connectivity. No matter, I rewired the offending pins and changed the code to suit – fixed. 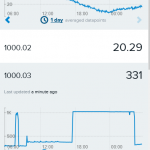 So the firmware connects to network and the sensor readings are being received, all working great – but where to send the data to? While I’d eventually like to have the data stored and processed locally, Xively seems like a choice to get things up and running with little fuss. I can let the receiver run 24×7 for testing while I sort out something more permanent locally – or if Xively does all I need that it can stay there – meh at this stage who knows. Anyway, the developer section of the Xively site is pretty simple, find and download the Arduino library from git add it the the Arduino libraries folder and your away. Total integration time was less that one hour including some optimizations. Here is the public link for the prototype. The format is of the channel is XXXX.YY, where XXXX is the transmitters serial number, and YY is the sensor input number on that particular device. You can see the setup is nice and compact but I don’t like that I cant use the POE adapter board and a shield on the EtherTen at the same time so I still need to power the device from USB or the DC jack. The nRF module is pretty much sitting over the shielded RJ45 connector which is probably acting as a ground plane – so not ideal. Anyway for now I have a handy 12VDC source readily available so I’ll hook up the DC jack. Then I don’t need to have it connected to my desktop PC all the time – except for debugging. Update: Things have gone fine expect for an outage at exactly 9 PM one night. Not sure why – but the timing seems to perfect, perhaps the DHCP lease expired? I changed the code to renew the DHCP lease and left the debugging output running to hopefully catch something. Could have been a random power issue resetting the Wiznet chip – who knows.